18 Geeky Furniture Designs: Creative or Crazy? While we would expect gamers and geeks would seek to shut out geek world of consoles and controls for a while during the day but it seems contrary – They want to recreate virtual world inside their real homes. Try to understand the geek’s world or be one of those coolest geek? Just take a look at this gallery of uber-cool home and office appliances, furniture and other decorative elements. Hope you enjoy! If you’ve ever tried to breastfeed your plants, it may be time to admit that you have a serious garden coddling problem. 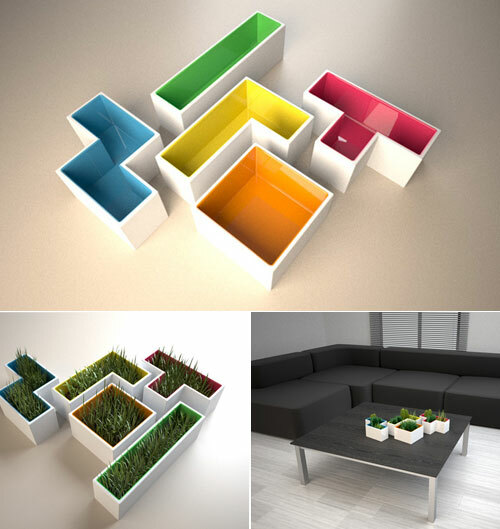 Why not channel all that extra energy into playing Tetris with their tetromino shaped pots? After awhile you may even forget there was anything growing in them; which means you’ll finally stop killing your plants with kindness and see those Perennials through to adulthood; or possibly subject them to Tetris induced neglect. Eh, it’s a start. 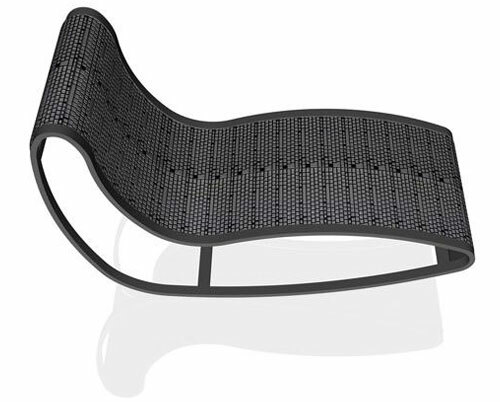 Designer Dante Bonuccelli and Lamm have created a unique armchair for the UMUL 2009 project (Use More, Use Less), a permanent workshop on re-use in design. It’s back is made of computer keys, which if they flex, might add a heretofore unseen level of comfort from keys. 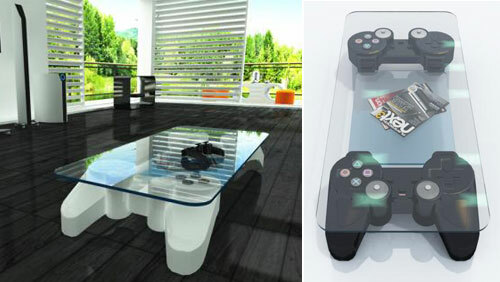 Stephane Perruchon has designed extremely elegant looking PS3 Coffee Table. 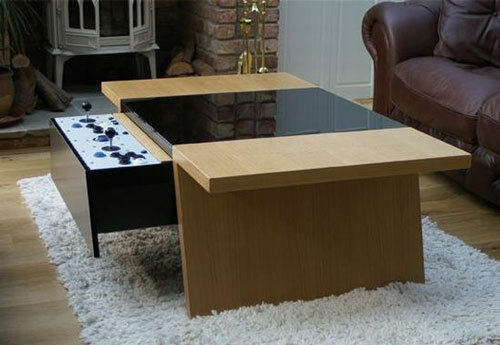 The designer brings his video game fascination to the real world with this PS3 table that features handmade PS3 controllers as the base, complete with two handles made of ABS and then decorated with the buttons. 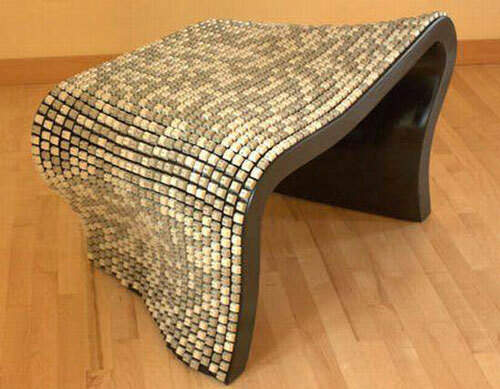 Designer Nolan Herbut created this piece of art by actually recycling and mounting around 2000 keys on a baltic birch wood bench thus doing our butts and our environment a huge favor, first by reducing the high amount of E-Waste we generate and secondly by giving our bum a nice and cozy place to rest upon. 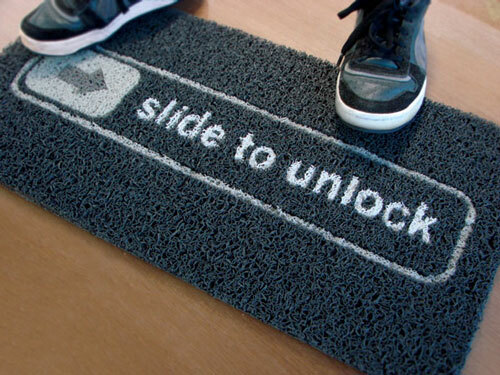 This fun and super geek doormat comes with the famous inscription inspired by iPhone “Slide to Unlock”, nothing better to place in front of your door. If you slide your feet across this doormat, it will open your door! OK, it’s not true, but even without this interactive still very cool. 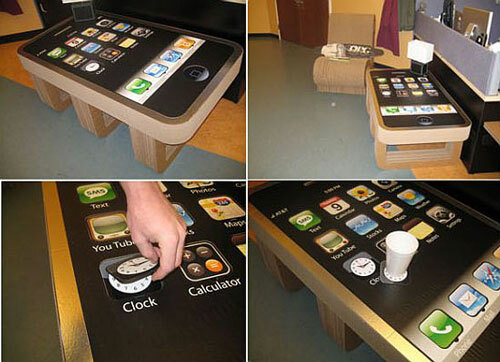 Inspired by the iPhone, iLounge readers Tuan Nguyen, Ken Thomas and their associates have created an iPhone coffee table. According to Nguyen, the table is “completely made of corrugate and glued together with white glue,” and features removable, usable coasters built-in. Congrats to Tuan and his friends on their creation — more pictures of the table and coasters are below. 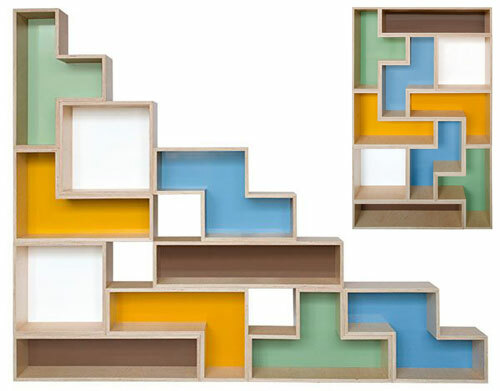 The shelves are modular and are made of lightweight sustainable Finland plywood. You can choose a white or natural finish for the wood, and white or colored metal backs. They can be attached to each other, hung on the wall or left separately to create that I’m-a-casual-yet-stylish-gamer statement in your home. 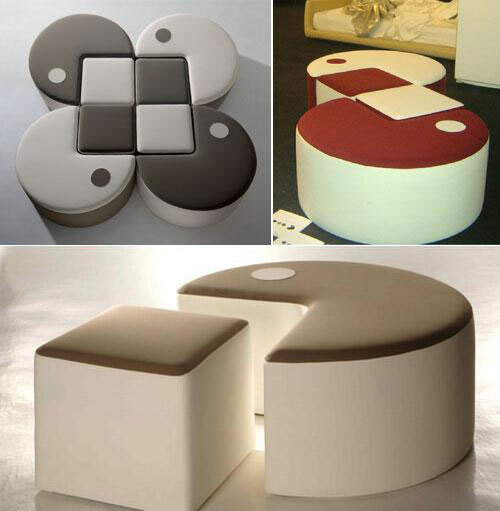 Creative Pac-Man inspired seating furniture set by QAYOT. – made up of raw wood particles, thk. 18mm, handwood fir and faesite. Large RSS Lamp Shade and Large F1 and F2 Lamp Shade both measure 25 cm X 25 cm x 25cm, and are handcrafted from wire and fabric (so use a CFL or LED bulb to prevent burning the shade). 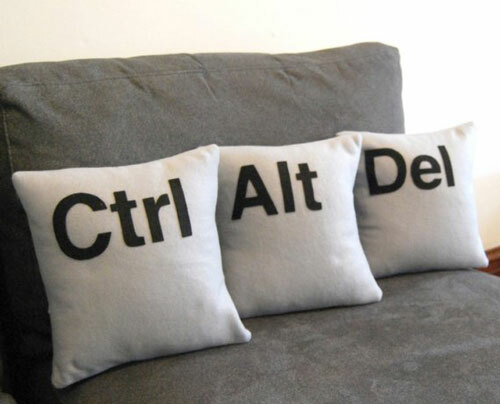 Reboot your living room with this three pillow set. Light gray pillows look as if they’ve jumped right off your keyboard. This furniture concept consists of Super Mario Bros themed shelves, end table and clocks built by Neatoramanaut Dennis and Judith for their apartment. While the clock features the scene from the Game Boy video game Super Mario Land, the shelf is made out of their growing collection of videogames by using the boxes with the background of hills and a cloud, all made of wood. Made entirely from solid beech, the Jigsaw Puzzle Table consists of individual jigsaw shaped pieces that fit together to create a unique occasional table. Available in two sizes, this clever and imaginative piece of furniture is great fun to put together and, once assembled, is both an attractive and unique table that fits comfortably within a wide range of room settings. 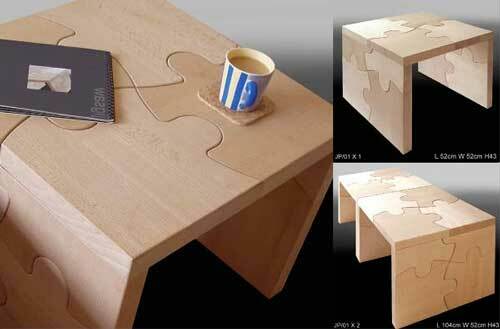 The table can be used individually as a side table, or combined with other units to create larger tables. This has got to be my favorite piece of furniture, ever. 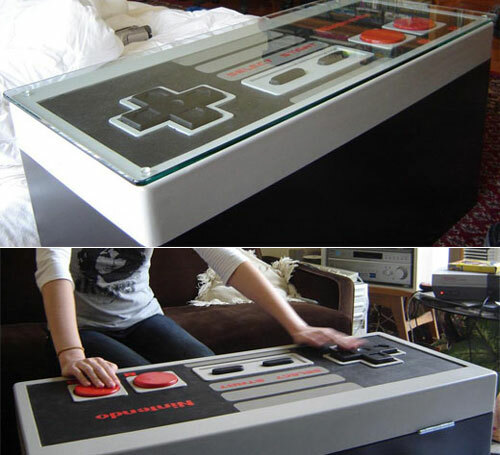 Not only does this coffee table look like a giant NES controller, it’s actually fully functional! Lovingly constructed by Kyle Downes of Ultra Awesome, the table also offers ample storage for all of his other gaming systems. The arcade gaming tables from the house of Surface Tension are designed simply to bring retro gaming back to life.Available in walnut or oak finish, Surface Tension’s new Arcade Coffee Table has a 19” LCD screen concealed within the glass panel on the top, while other controls are under the table. Compatible with MAME emulation software, the retro arcade machine features Shuttle PC, dual core CPU, 2GB RAM, 160GB of hard drive, 2 sets of controls, Happ arcade buttons, Happ illuminated trackball, Sanwa joysticks, and volume controls. 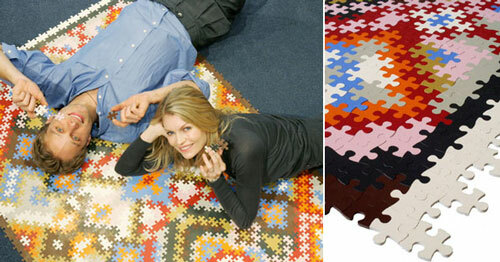 The Persian Puzzle Rug, anyone who loves both the rugs and puzzles can enjoy putting together their own rug made from cut out pieces of recycled, natural and synthetic rubber. Connecting the pieces together can be a family project which can then be displayed anywhere in the home (or office). If you like listening to tunes while showering, then you probably have a shower radio or stereo in your bathroom. But why not kill two birds with one stone. What if your shower head were a stereo also? I mean the little holes already look like a speaker grill. 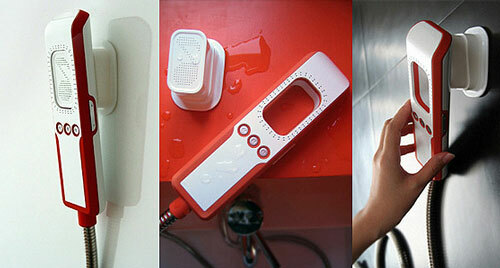 Just imagine a digital MP3 player that detaches from the shower head/speaker. You could load up your favorite tunes and use it like any other MP3 player. What sets it apart is the ability to dock it to your shower head activating the external speaker and when you’re done, just grab it and go. 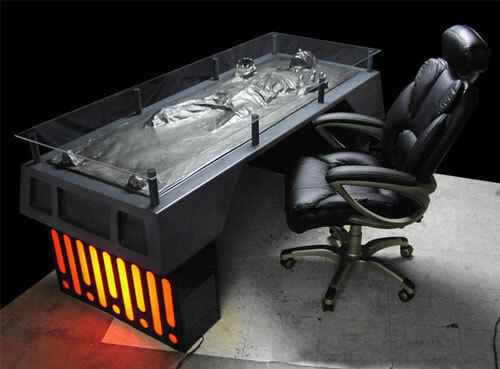 As a reminder of the coolest scene in the coolest Star Wars movie, the Han-Solo-Frozen-In-Carbonite desk is straight up awesome. Having this beauty in your office would leave even the most tangentially geeky person in awe of your furniture owning prowess. How could anyone say no to a person sitting across from them at this table? One look down at Han’s frozen scream and they’d do whatever you want. 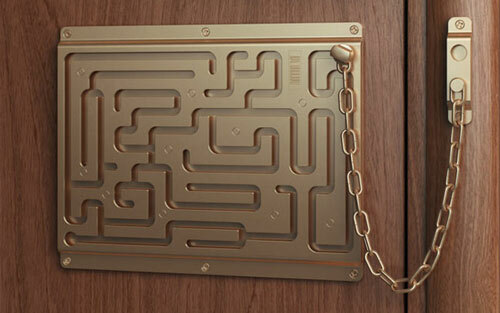 The question is no longer “can they get in” but rather “can you get out?” This funky chain lock design is anything but fire-safe and far more a novelty than a functional piece of door hardware, but it is still rather ingenious nonetheless. Constructed from titanium alloy, fixed in place with 10 different screws and load-tested to a whopping 700 pounds of force, if you can not figure this out you are essentially as good as dead. 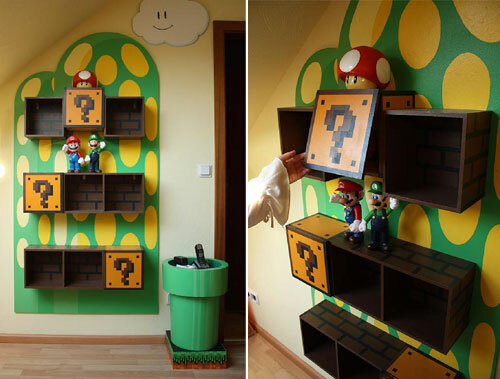 17 Of The Geekiest Furniture Items For Your Home « シ最愛遲到. !